Sunset Ridge Exteriors is a locally owned and operated, licensed and insured general contractor with more than 20 years experience in the home improvement industry. We operate throughout Southern Wisconsin, including Columbia, Dane, Dodge, Green, Iowa, Jefferson, Lafayette, Richland, Rock, Sauk, Walworth and Waukesha counties. Sunset Ridge Exteriors was officially founded in 2010 by Michael Richichi and Matt Eaton but was years in the making. Michael and Matt met while working for another area company and realized they wanted more control over working to meet their customers needs and expectations. And so, Sunset Ridge was born with the goal to serve the home improvement needs of homeowners by providing high-quality products, long-lasting work, and professional service. Our clients enjoy superior workmanship that will serve them well over the long term. One of our greatest strengths as a company is the quality of the products we offer. All of our products come from leaders in the residential and commercial industry along with some of the best warranties in the business. We know that your standards as a homeowner are high, so we make ours even higher. We take pride in our products and workmanship and it shows. All of our workers are considered a part of the family and we find it necessary to employ honest, skilled and dedicated workers. At Sunset Ridge Exteriors, we approach every project as an opportunity to build a long-term relationship with our customers. We want our clients to look to us for help with future projects. In addition, we want our customers to feel comfortable referring us to their family and friends. We realize that our ultimate success is built on the continued satisfaction of our clients. 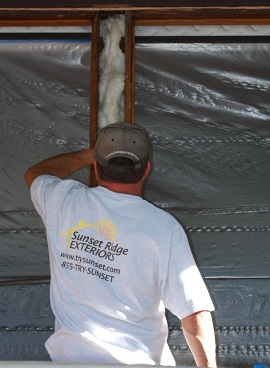 We hope you will join our Sunset Ridge Exteriors family too!